A periodontist is a dentist who specializes in the diagnosis, prevention and treatment of periodontal diseases and in the planning, placement and maintenance of dental implants. Periodontists are familiar with the latest techniques for diagnosing and treating periodontal disease. In addition they can perform cosmetic periodontal procedures to help you achieve the smile you desire. Periodontists receive three additional years of education beyond dental school devoted solely to all the above mentioned therapies. The word 'periodontal' literally means around the tooth. Periodontal disease, also known as gum disease, is a chronic bacterial infection that affects the gums and bone supporting the teeth. Often, this destructive process has very mild symptoms. If not treated properly, teeth can become loose and may have to be removed. During your first consultation visit, Dr. Sutherland will review your complete medical and dental history with you. He will examine your gums, check to see if there is any gum line recession, and assess how your teeth fit together to see if any are loose. Dr. Sutherland will also take a small measuring instrument and place it between your teeth and gums to determine the depth of those spaces, known as periodontal pockets. This helps him assess the overall health of your gums. If there is concern regarding individual teeth, Dr. Sutherland will examine those areas. X-rays may be taken to observe the health of the bone below your gums. Once your periodontal health has been evaluated, Dr. Sutherland will work with you to determine the treatment options that are best for your oral health. 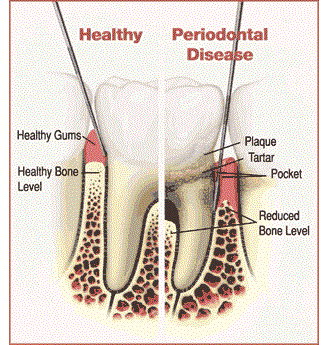 What other factors might contribute to Periodontal Disease? It is customary to pay for professional services when rendered. We ask that the fee be paid in full at the time of treatment. An additional fee for X-rays may be necessary. We eccept Visa, MasterCard, Check, Cash, and Care Credit. Dental Insurance: If you have dental insurance, we will be happy to file your dental claim for you at no charge. Upon request, a predetermination for services can be sent to your dental insurance company prior to additional periodontal therapy. The fee for our service is the responsibility of the patient.